Korean ag-brand Kioti says its latest release- the Mechron 500 utility vehicle (UTV) offers the perfect solution for operators wanting convenience and safety with their workhorse without compromise on speed and comfort. PFG Australia sees the Kioti Mechron 500 UTV overtaking ATVs as ideal on-farm workhorses. The vehicle, distributed by PFG Australia, features a 500cc liquid-cooled single cylinder petrol engine with electronic fuel injection, delivering a top speed of 60km/h. Two-speed CVT transmission; four-wheel drive with diff locks; front and rear hydraulic disk brakes; and easy tilt with gas strut come standard on the Mechron 500. A double wishbone suspension allows for a smoother ride regardless of load while the rack and pinion steering contributes to a lighter and more comfortable operation. The Mechron 500 also features a four-post ROPS with sun canopy and twin bucket seats with auto-style seatbelts for a safer ride. It has a towing capacity of 319kgs and a 28-litre fuel tank. The cargo tray is 840mm long and 1180mm wide with a depth of 240mm, providing sufficient space for various farm equipment including fencing materials, a spray tank, or even fishing gears. PFG Australia is expecting the Kioti Mechron 500 to make serious inroads into the four-wheeled ATV market and says dealers are equally enthusiastic about the machine. Wangaratta dealer McGregor Farm Machinery’s Brendan Breen thinks the Kioti Mechron will take over ATVs as ideal on-farm workhorses because it offers so much more. "You’ve got the 60km/h speed if you need to go chasing up livestock; you can carry your gear and a co-worker; you can tow things and you’ve got all the safety and comfort factors too," he says. "The adjustable suspension system is pretty cool, you can set it up to suit various conditions and load capacities. "It’s a very versatile machine in terms of what it can do and there’s plenty to like about it whether you’re 18 or 80." The Kioti Mechron is now in stock and available for delivery in many parts of Australia. 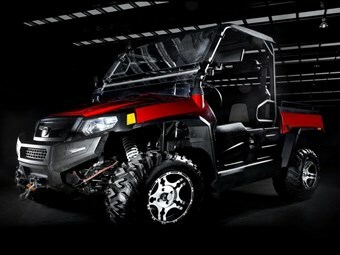 For more information or to locate your nearest dealer, visit www.kiotitractors.com.au. Look up off-road vehicle specifications.